The swans are back. Each year a flock of swans visits the lake near my in-laws home. They visit for a day or two each year on their annual migration bringing a smile to my face. The swans swim in the lake, resting and making me believe in beauty again. There is just something about the arch of their necks and the sight of their stark white feathers against the dark water that makes me stare in wonder. But for all of the swan’s outward beauty, what I like best about the swan is their lack of perfection (it’s nice to know we all have flaws). 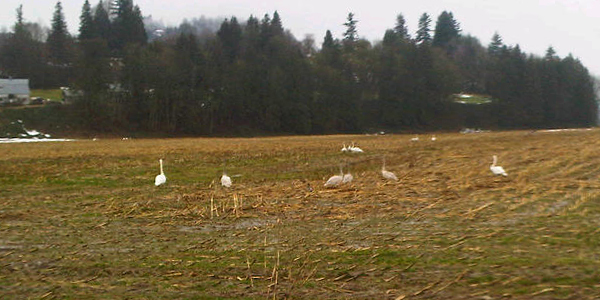 Of all the birds that live or visit the west coast of British Columbia, the swan is the least vocally blessed. Hawks cry in a way that makes my soul ache. Seagulls pierce the sea air with the sound of discovery. Crows, while not beautiful in song make me think they have a story to tell, but the beautiful swan with it’s perfect arching neck and flawless feathers has a call that sounds accidental. Swans are romantic and mysterious, but the one beauty they were not blessed with is in their song. Be inspired by the disconnect between the perfect appearance of this creature and its less than elegant voice. Does the voice of the swan inspire you to romance like the tale of the Swan Princess? Does it make you think of tragedy like Swan Lake? Or are you inspired to a tale of humour or moral lesson. Spend a few minutes thinking about swans, then tell the story of a swan’s voice. Aim to write 500 words. Happy writing.